Appearance (0-20): Well hello there Savi. And how are you? Looking good I see. 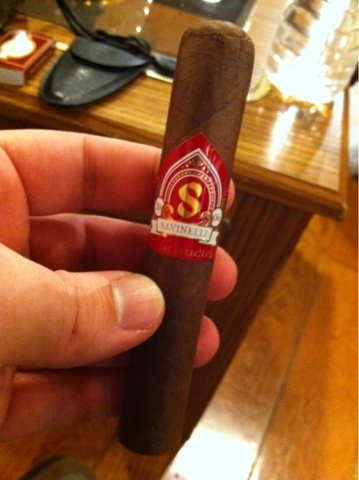 This Special Selection has a really nice looking habano wrapper with only a few small veins. The band itself looks prefect too – it has rich red, gold, and white that makes it look almost regal. Construction (0-20): This robusto looks good from the outside and as I'm feeling around I can tell there is going to be no issue. Its well packed and I cant wait to light it up. But before I cut, I noticed there is a triple cap on this little stinker. So, quality absolutely matters here. I cut and there is almost no debris. Very nice. Upon lighting I encountered some slight issues with the burn, but it was a minimal amount of unevenness. It held together very well as I didnt have to ash through almost half of the cigar. The draw was slightly tight, but otherwise... yeah it was damn good. Outstanding. Strength (0-20): From the original look of this I thought it would be somewhere in the mild to medium range and it was pretty spot on. Although I would say this is almost literally in the middle of the medium range. It's not in any way light, but also not overpowering. Not quite what I expected, but very well balanced none the less. Flavor (0-20): Upon first light its got a really woody taste with quite a bit of vanilla sweetness. Theres some slight hints of roasted nuts and some light notes of some sort of fruit. So needless to say its one that has a nice natural sweetness. The vanilla flavor sticks with you throughout, but it is in no way overpowering as compared to the other flavors. Thankfully you can consider this to be consistent throughout the entire stick. Personally I would have liked a little bit more complexity, but the flavors present played well with eachother. Value (0-20): I have had a lot of cigars that are around the $7.00 range that were dogs compared to this one. Its absolutely worth the price to pick one up and hell, its absolutely worth picking up again and again. Additional Notes: Paired with water at Cigars International. Overall (0-100): This is the third of this particular Savinelli I have had, and each and every time I have enjoyed it. There are some great naturally sweet flavors that come out while smoking the 2006 Special Selection. The outstanding portion of this, though, was the construction and appearance. I would absolutely recommend this cigar to any smoker as it falls right in the medium range where almost anyone can handle it, and it is priced very well for the stick you get. Very nice work! Judging by your reviews the Savinellis are top notch; can't wait to try one. Both my brother and I have had nothing but good experiences with the Savanelli cigars. I can't wait to have more of them! Nice review Ninja! One of my shops nearby has this cigar and you just moved it up the smoke it list. Its absolutely worth a try at least once. Hope you enjoy it!